Carsington Sailing Club hosted a Hansa Grand Prix two day event organised by Carsington Sailability on 13/14 June. Fourteen boats competed for the “Duke of Devonshire Cup”, “Bakewell Rotary Shield” and “Hansa Grand Prix”. The event included four Hansa/Access classes and attracted entries from Sailability clubs from far and near. The event program included six races to be sailed over the two days. The first three races to be sailed on Saturday were to form part of the Hansa TT series. The event started with a very wet Saturday morning which persisted for most of the day, but this did not dampen spirits. After registration, a good lunch provided by the galley and in light winds competitors started the race program at 1.30pm aiming to complete three back to back races that afternoon. For the first race competitors followed a triangular course set within view of the clubhouse so that spectators could enjoy watching the racing. Racing manners were impeccable as the buoys were rounded and the new course chosen. During the race the wind backed off so much that the second race had to be postponed. Competitors returned to the jetty to await instructions from the Race Officer. That was the end of racing for that day; fortunately the race team were able to provide results for that race so positions for the Hansa TT could be awarded. Pieter the Carsington SC Commodore presented the trophies after thanking competitors for attending and wishing them well for the next days racing. Competitors enjoyed a Grand Prix dinner provided by the galley thanks to Sandra and Debs and completed the day with lively chat. Sunday looked a more promising day weather wise with a prediction of fair winds and mainly dry conditions. With only one race completed, discussions turned to the day’s race program. It was decided to go for two races back to back followed by a third, after a short break to complete the event. The Galley provided a breakfast menu and boat launching started shortly after the 9.30am briefing. The first race was underway on time thanks to the jetty crews. Again competitors competed on a triangular course. Wind conditions remained fair for all three races allowing the shortened race program to be completed a little earlier than planned. Trophy Medals and Certificates were presented for First, Second and Third places for each fleet. Les Philip was awarded the Duke of Devonshire Cup and Simon Jackson was awarded the Bakewell Rotory Shield for the best Carsington Rotary Boat. A special award “The Derek Lee Memorial Trophy” was awarded to Mark Gundry for the best improved Carsington Sailor over the event. The awards were presented by “The High Sheriff of Derbyshire” Oliver Stephenson. A vote of thanks was given to the Carsington Team for organising the event with special thanks given to the volunteers who gave excellent support to the competitors and their support teams. 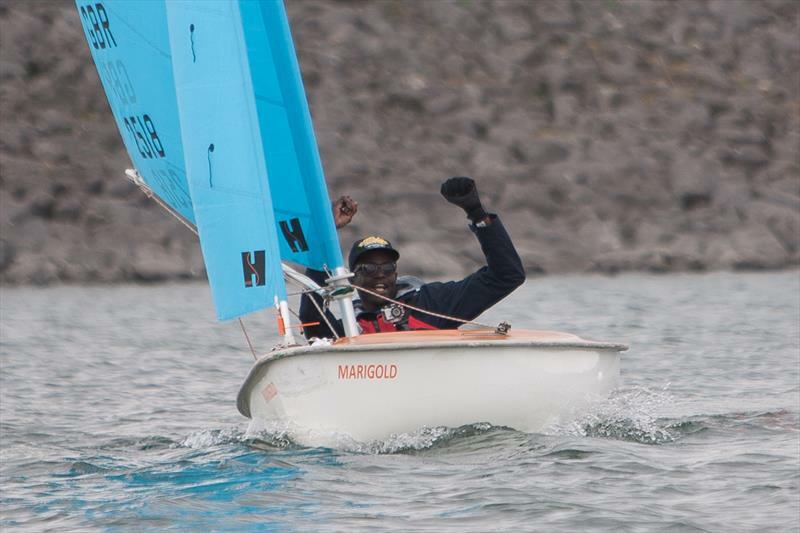 Carsington Sailability has organised Hansa events for the past 15 years and it was good to see the sailors enjoying the competition again. Thanks to everyone who attended making the event such an enjoyable experience, hope see you all next time.